I just finished a game of Rainbow Six Siege Outbreak with over 200 kills – I was playing as Tachanka. If you know Siege at all then you know how silly that is, yet Outbreak sees the long maligned operator racking up kills at a rate hitherto unknown in the tactical shooter. It is safe to say that Outbreak is a vastly different experience from that of Siege’s multiplayer or Terrorist Hunt modes, then. Want to know how new operators Lion and Finka will play? Here’s what we thought of Rainbow Six Siege Chimera’s gameplay. For starters, instead of white masks or Ash mains you will be up against an alien infection that has turned the residents of Truth or Consequences, New Mexico into a variety of monsters ranging from armoured brawlers and exploding leapers, to casters that buff nearby infected and behemoths that can run through walls. 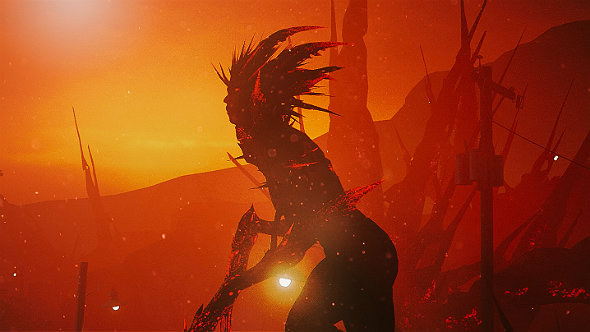 Enemies in Outbreak sprint straight at you: they are fast, agile, and deadly. That adds a fresh dynamic to the now three-year-old game – Outbreak is Rainbow Six Siege meets Left 4 Dead and every bit as fun as that sounds. These are no standard zombies and you will have to learn the nuances of each enemy type in order to get very far in Outbreak. Even the standard Grunts have harbour surprises – alert them and they will suddenly armour themselves, massively increasing the amount of damage they can take. Hedgehog-like Breachers dart around the environment with dizzying ease before exploding when they get close to you, but these kamikazes can also attach themselves to reinforced walls and breach them. Rooters send waves of spikes up through the ground pinning operators to the spot before burrowing underground to safety. Then there is Outbreak’s ranged enemy, Apex, once-human towers of gore that drift around the map buffing other infected, nerfing your team, and throwing blinding projectiles at you. Finally, Smashers, which… well, they smash. But on top of that they also have nigh-impenetrable skin and can run through walls. Yes, that is another type of smashing – we know. 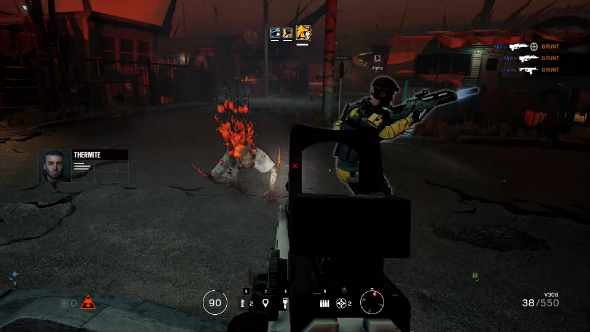 With so many fast and tough enemies on screen the biggest challenge of Outbreak is getting used to firing your weapon so consistently. Years of tense Rainbow Six Siege multiplayer matches have taught the merits of restraint and patience, and while some stealth is advised for taking down Grunts before they buff themselves, it is never long before Outbreak descends into chaos. Juggling multiple enemy types, cycling through operator gadgets, keeping an eye on the objective, and responding to your teammates – Outbreak is relentless. All of that carnage forces you to work together as a team – something you really should be doing by now. Playing through Hospital – one of three maps exclusive to the co-op event – our strike team of three operators settled on a strategy for clearing out the claustrophobic corridors that revolved around my chosen operator, Tachanka. I set up the defender’s turret, Finka provided fire support for reloads and enemies attacking from behind, and Ash would use her speed to go and round up as many infected as possible before leading them back to my turret. The resulting kill feed was something to behold. Another objective, this time on the Junkyard map, saw our team of Lion, Buck, and Smoke defending some planted explosives in an abandoned barn. Up until that point I had found little use for Lion’s x-ray drone scans, which highlight moving enemies for a few seconds, but one deployment just before the horde came streaming in through every window and doorway convinced me of its potential. All of a sudden the screen lit up red with the outlines of dozens of infected. 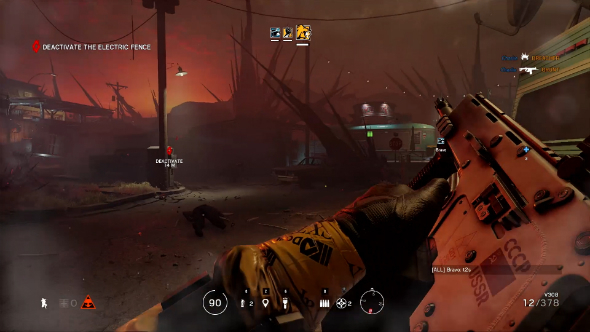 I opened fire into a wall taking down four or five before they were even in view, Buck used his Skeleton Key shotgun to obliterate another cluster through a barricaded window, and Smoke filled an open doorway with his toxic gas grenades knowing their was another pack of infected coming from that direction. That serendipitous interplay of operators and environment is distinctly Siege, and helps set Outbreak apart from other co-op horde games like Vermintide and Left 4 Dead. And different combinations of enemies are just as capable of altering the way a round plays out, with foes like Breachers and Smashers ensuring there are no safe spaces. The hour I spent with Outbreak made for some of the best moments I have ever had in a co-op game, which is a bittersweet revelation given that the event will only be available for four weeks. Excited to play Outbreak? Let us know in the comments below.